Examples of biopolymer modification to introduce functional groups for labeling and conjugation. Native proteins, oligos, and peptides have no aldehyde functional group. Introduction of aldehyde groups into these biopolymers allows them to react with other molecules specifically at the aldehyde site through reductive amination, oxime, and hydrazone formation. This modification introduces aldehyde groups on the surface amine (Lys and N-terminal amine) of the peptide/protein or amino-modified oligo through amine reactive reagent: succinimidyl p-formylbenzoate (SFB). Usually multiple aldehyde groups are introduced onto the biopolymer depending on the population of surface amine functional groups on the biopolymer and the extent of the reaction. Some native proteins and antibodies contain carbohydrate modifications. Aldhyde groups can be introduced to the carbohydrates through periodate oxidation. Only one or few aldehyde groups are introduced onto the biopolymer depending on the nature of biopolymer and the extent of the oxidation. This method allows site-specific modification and conjugation. This is an intermediate step which introduces thiol group(s) to a biopolymer and prepares it for conjugation through sulfhydryl groups. The modification is generally done right before the conjugation or labeling, however, the modified biopolymer can be stored in the presence of reducing agents. Basic chemistry invovles reacting amines with 2-Iminothiolane (Traut's reagent) generating sulfhydryl groups in a biopolymer. Multiple sulfhydryl groups are introduced onto the biopolymer depending on the available amine groups on the biopolymer and the extent of the reaction. This is an intermediate step which introduces thiol group(s) to a biopolymer through the reaction of amines with N-succinimidyl S-acetylthioacetate (SATA). The modified biopolymer contains a protected sulfhydryl group and can be stored. An extra step is required for removing the thiol protection right before labeling or conjugation. Multiple sulfhydryl groups are introduced onto the biopolymer depending on the available amine functional groups on the biopolymer and the extent of the reaction. 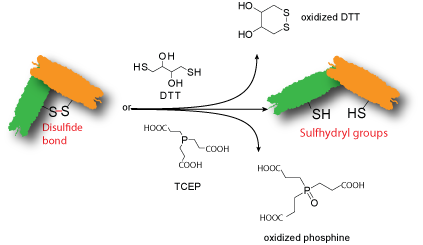 The removal of thiol protection doesn't require disulfide reducing reagents. Derksen, J. T. P.; Scherphof, G. L. An improved method for the covalent coupling of proteins to liposomes. Biochimica et Biophysical Acta - Biomembranes 1985 Mar 28; 814(1):151-155. Some biopolymers contain disulfide bonds. If disulfide bonds are not vital to the biopolymer's activity, these disulfide bonds can be cleaved to generate free sulfhydryl (thiol) groups using Cleland's reagent dithiothreitol (DTT) or Tris(2-carboxyethyl)phosphine (TCEP) for further modification.Single or few sulfhydryl groups are introduced onto the biopolymer depending on the number of disulfide bonds present on the biopolymer and the extent of the reaction. The modified biopolymer contains a free sulfhydryl that has a short storage life and should be used immediately for the next reaction. Burns, J A.; Butler, J. C.; Moran, J.; Whitesides, G. M. Selective Reduction of Disulfides by Tris(2-carboxyethyl)phosphine. J. Org. Chem. 1991, 56, 2648-50.